The Chinese Mantis is a very common mantis species. Originally it only occurred in Asia, but because of international commerce it has been introduced in North America. There this species is thriving and can be found in almost the whole continent. 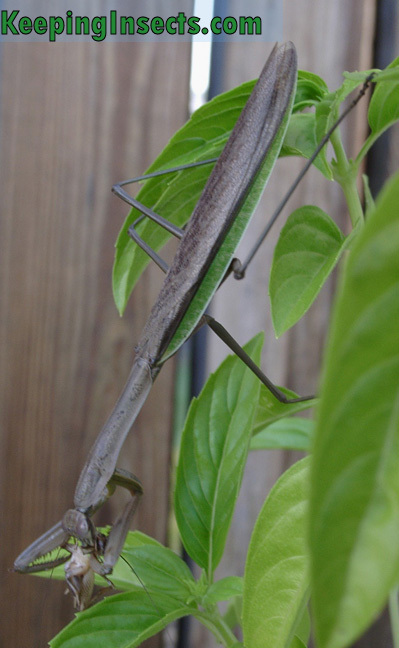 The Latin name of the Chinese mantis is Tenodera sinensis. It can be kept as a pet and is easy to care for. Many people in the United States and Asia find this mantis in nature. You can enjoy the strange beauty of this insect by making pictures, visiting it in the plant where it is living in or by bringing it indoors as a pet. How to recognise a Chinese mantis? Well an adult Chinese mantis is brown in color with brown wings with a green edge. The body shape is like a “stereotype” mantis without any special decorative or camoeflaging appendages. It will reach a size of around 9 cm (almost 4 inch). A nymph (young mantis) of the Chinese mantis is brown and does not have any wings or special appendages. The adult female is larger and heavier than the male, but both sexes look pretty much the same throughout there life. You can distinquish males and females by the length of the antennae (males have longer) and by counting the segments on their abdomen like so. A Chinese mantis is usually pretty docile and quiet. It won’t walk around a lot if it gets enough food. It will stalk a prey around its cage if you keep it as a pet. It is not an aggressive praying mantis, but it can strike a defence pose when threatened. The Chinese Mantis is a very easy mantis to take care of, because it does not require a lot of special temperatures or humidity. The ideal temperature is about 25 °C, but a temperature between 22 and 30 ° C is perfect too. At night the temperature can be allow to drop, but it should be at least 17 ° C to ensure proper development. When exposed to temperatures below 8 °C a Chinese mantis may not survive. The Chinese Mantis does not need a lot of humidity. 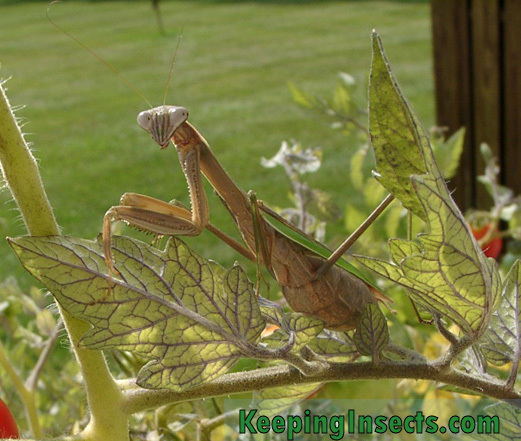 Keep the mantis in a well ventilated enclosure and spray with water two times a week. The mantis will drink from the water droplets when it is thirsty. 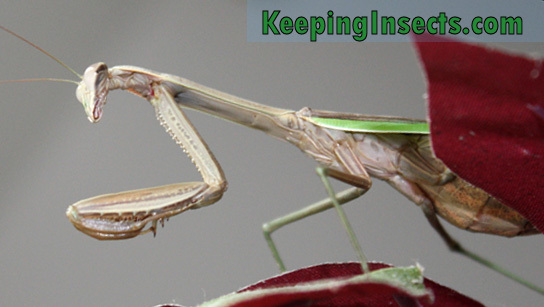 Want to read more about feeding and keeping a Chinese mantis? You can read all about it on the general pages of caring for a mantis as a pet. Chinese mantids are ferocious predators that will also prey on each other. Do not keep Chinese mantids together in the same cage. Very young nymphs can be kept together, but even in young ones cannibalism can occur. Make sure they have enough to eat. You can breed Chinese mantises in captivity. 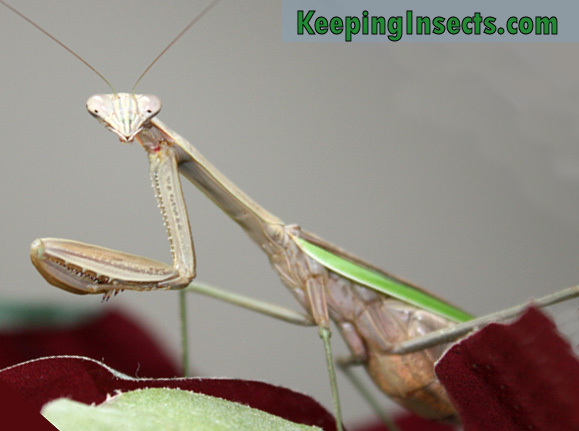 Some companies breed this mantis species to sell them as natural predators in greenhouses. The companies sell the egg sacs (ootheca) to greenhouse farmers. 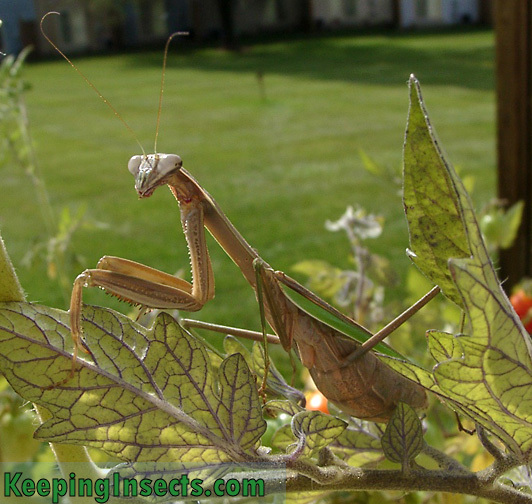 When the young mantises hatch in the greenhouse they will eat all pest insects like aphids and small flies. 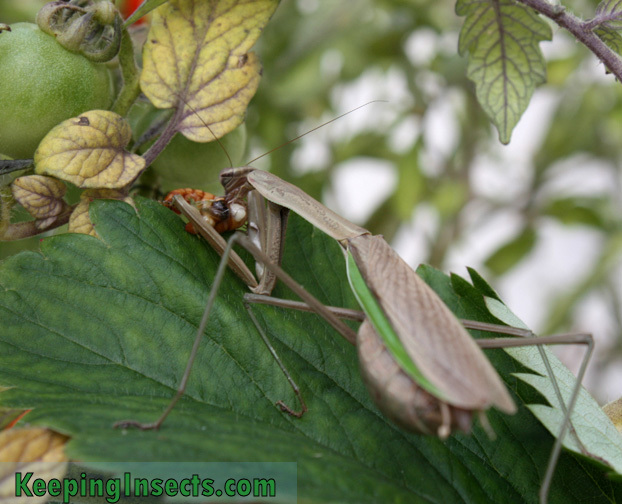 If you want to breed Tenodera sinensis yourself, you need a male and a female that are full grown for at least 2 weeks. How to see if you have both sexes, you can use this sexing method. Then you need to place the male and female together in one enclosure. Make sure the female has eaten A LOT before you do this. Even then it is possible that the female will eat the male before, during or after mating. If mating has occured you should separate both mantises again. After one mating the female mantis will produce fertilized eggs for the rest of her life. She will produce foam-like egg sacs called ootheca. In one egg sac of a Chinese mantis you can find between 30 and 100 eggs. She will produce 3 to 7 egg sacs in her life if she has enough food. 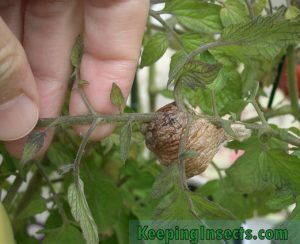 Keep the egg sac in the same conditions as you keep the adult mantis. The eggs will hatch in around 6 weeks. If you plan to release the baby mantises into nature, make sure the eggs do not hatch in winter. If you want to postphone hatching of the eggs you should keep the ootheca at 8 °C (or between 6 to 10 °C), like in your attic, basement or garden house. If you find an ootheca in nature you can leave it there, the mother knows what she is doing and probably the eggs will be safe in winter. 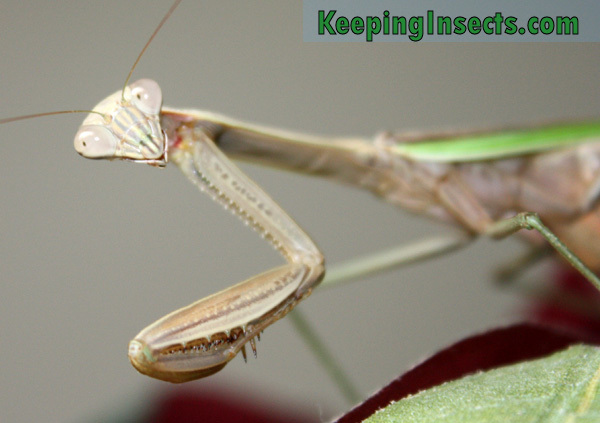 Want to read more about caring for mantis eggs? Read the page about that.